I bought the INCRA 150mm T-Rule a few weeks back partially in anticipation of a non-guitar jobs and projects I'm working on but more out of curiosity in how much I could improve my marking up beyond "remembering where I might be adding in tolerances and compensating". I've never been happy squinting at the true end of a ruler or trying to lay a mark perfectly in line with graduations on the side of one. Couple this with fighting against unsharp pencil lines that gravitate into the grain and I pretty much shiver about how much tolerance it is possible to add into workpieces! The T-Rules are one of many similar precision products produced by INCRA and are available in a variety of configurations. In their most basic form they made of thin sheet steel perforated by laser to a precision of 0,25mm Metric or 1/64" Imperial. The steel rule is mounted by two knurled thumbwheels to a slotted length of anodised red aluminium extrusion allowing the rule to be offset for better balance when working across entire boards. 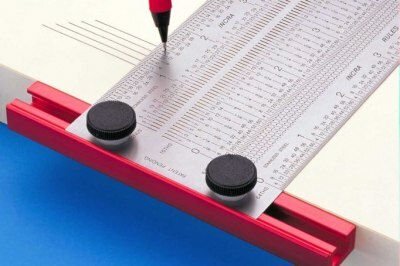 The perforations are designed to allow a 0,5mm mechanical pencil lead or marking scribe to sit in the appropriate measure. Sliding the aluminium section along a straight edge produces a highly accurate parallel line to the edge which lays dead in the centre of the measurement. The square edge can also double as a great 90°....square edge! My T-Rule was bought from JE-Nettiverstas.fi and turned out to be surprisingly expensive. This wasn't JE-Nettiverstas' pricing policy....it's just that these things are just not cheap! I kind of expected it would be, however it is a comparatively small investment over the long term when you consider the returns the tool offers. Initial impressions of the T-Rule were purely on the surprising thinness of the rule (it makes a great sproing noise though) and the obvious overall quality and precision. Without a doubt, rough careless handling will result in a bent or damaged rule so it is not a good choice for a hectic or rough working area. It definitely benefits marking preparation in a calmer, quieter workplace where you can concentrate on producing the high quality results the T-Rule is capable of. Adding the T-Rule into my marking tool collection makes the process more and more like meditation, laying each and every line crisply, evenly and beautifully. The purchase of a good quality technical drawing pencil loaded with slightly harder leads will truly turn you into the Mace Windu of work prep. No really. How does this attention to detail transpire into the end product? Tolerances easily compound into huge errors leaving anything from slightly sloppy joints to disastrous misalignments. This just makes the original marking up a rough guide which at best ends up fixed in the mix. Tightening tolerances to 64ths of an Inch or quarter of a millimetre greatly reduces margin for error. Most importantly - in my opinion - using tools capable of precise results increases your ability to concentrate on the work in hand. Invariably you care and think more about what you are doing - all part of that "measure twice cut once" mentality.